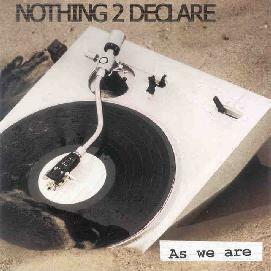 Nothing 2 Declare - "As We Are"
This UK outfit works with the folks from Stone Premonitions but this is not about space rock at all. I reviewed one of their previous releases some months back and although this has some similarities to that release, this is far better. Five tracks in all and recorded in July 2002. "Perfidious Man" opens the CD with some serious hypnotic riffs. "Fallen Angel" is a ballad but an excellent song. "Ranvier" is really in the stoner rock vein with a cool riff and wah guitar. "Cycle" starts with a groovy bass line and turns out to be a solid melodic rocker. "Amber" ends the CD and is a great dark themed song with a heavy rock riff and the most psychedelic of the songs on the CD. Quite an excellent mini-CD from the band. I was a little disappointed with the drum sound on this production but you can’t have everything! For more information you can email Nothing 2 Declare at: nothing2declare@lycos.co.uk.